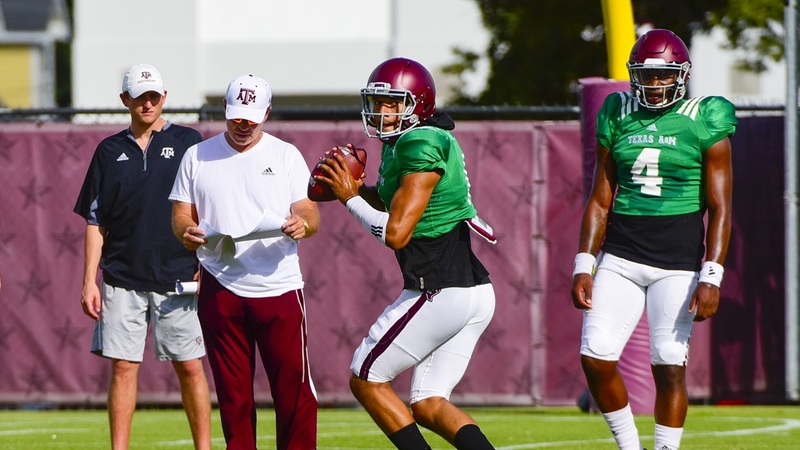 • We're probably still at least a week and probably longer away from finding out which quarterback will start against Northwestern State and become the first starter of the Jimbo Fisher era in Aggieland. As most anyone could have predicted, neither of the contenders has managed to create much (if any) separation. The two are alternating days as QB1, and I think it's fair to say they've both had very solid camps. If there's one thing I've noticed thus far, it's Kellen Mond's continued progression as a passer. From last fall to spring drills and now a week into August practices, he's looked like a different guy every step of the way. Whether that will be enough to push past Nick Starkel remains to be seen, but it's just worth noting because the sophomore's development when it comes to things like footwork, the way the ball comes off of his hand and visibly improved confidence is obvious to anyone who watches the Ags practice. Don't misread that either...it's not me calling my shot and saying Kellen is the guy. I'm being as honest as I can when I say the battle looks (and sounds) pretty even. I truly believe the starter will ultimately be decided by which of the sophomores performs best in live scrimmage action over the next 10-14 days. Redshirt freshman Connor Blumrick suffered a knee sprain and will be out a couple of weeks. Nothing serious, but another setback for one of the team's most popular dudes. • Barring injury, he's all but a certain redshirt, but I've been impressed with the way true freshman James Foster carries himself with the veterans and takes coaching from a demanding head man and position coach. I also like the way the ball jumps off of his hand and the fact that he throws a very catchable pass. Redshirt freshman Connor Blumrick suffered a knee sprain and will be out a couple of weeks. Nothing serious, but another setback for one of the team's most popular dudes and a guy who has been bitten by the injury bug too many times and deserves some good football fortune. • What Jay Graham was able to do last February hasn't been talked about nearly enough. The first-year running backs coach inherited next to nothing in the way of depth and SEC-caliber bodies, and one of three scholarship backs, Kendall Bussey transferred out. When you look at Graham's stable on the Coolidge Practice Fields, you see a group featuring what I believe is a future All-SEC runner at the top and a handful of promising young runners competing for carries behind him. Williams has picked up right where he left off in the spring. The junior has said he's in the best shape of his career and certainly looks the part. In addition to looking like a guy ready to emerge as one of the SEC's best, Trayveon has also naturally stepped into a leadership role, something he's doing by example and vocally out there. The four true freshmen have taken turns turning heads already. On Saturday, it was Jashaun Corbin whose name I heard first. The speedster not only did some nice things out of the backfield as a runner and pass-catcher but also looks very smooth as a punt returner as the Aggies and ST analyst Eric Russell continue a wide open search for kick and punt return duties. 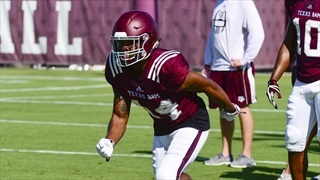 It's still way too early, but I loved Corbin's potential in the return game when the Ags signed him and would be surprised if he didn't emerge as a leading candidate as camp wears on. He'd also be my bet as to which young back gets the most early burn. The young man is explosive. Vernon Jackson has been better as a pure tailback than many expected and is a freshman to watch as fall camp continues. There was a time when I thought Charles Strong would be a prime-time candidate (and a good one) at fullback. Then he arrived in June much lighter than he was when he visited campus last January. Strong turned heads throughout the summer off-season, drawing rave reviews from teammates and insiders alike. Tall, very lean and muscular, the Florida product looks and runs like a pure tailback. I'd say he's easily over 6-1 and built differently than any ball-carrier the Ags have had since joining the SEC six seasons ago. He has workhorse potential, and I can't imagine Strong not seeing immediate playing time as a true fish. 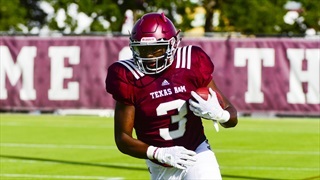 Deneric Prince has been an early bright spot and maybe a bit of a surprise, and Vernon Jackson remains one of the more interesting true freshmen on the Aggie roster. We're talking about a guy who played pretty much everything from quarterback to defensive end in high school and who was recruited literally into National Signing Day by the Aggies, Alabama, TCU and Texas. He's a unique football talent who looks good enough to see the field at tailback this fall. I also think he's better than what many expected as a pure tailback. And don't forget to include walk-on Kwame Etwi in the playing time discussion because he's running well, is as explosive as anyone outside of Williams and brings a veteran presence to the huddle. He'll be an important backup option, especially early in the season as the true freshman figure things out. • We knew heading into fall camp that the tight end position would have a chance to be a team strength, and that looks even more likely four practices in. Nothing earth-shattering to report on Jace Sternberger, as it would be hard to tell you all anything you didn't hear me say since his signing last December, throughout the spring and off-season and right up until last week. He's been dynamic in the passing game and can absolutely hold his own as a blocker. Tight end Trevor Wood has become a steadying presence for the Aggie offense and looks to contribute heavily this season. There was enough off-season talk centered around Trevor Wood that the expectation was that the Arizona transfer would be a valuable one-year asset to the A&M offense. However, I think the reality is that the 6-6, 255-pounder is going to be better than advertised. His combination of size and speed make Wood a truly problematic coverage assignment, and it's already clear that he has what it takes - in terms of his physicality and his mindset - to be a pretty devastating blocker. Another bonus that insiders have already begun to realize is that the well-traveled and experienced senior brings a much-needed veteran presence to Brewster's meeting room and the offense as a whole. True freshman Glenn Beal did a lot of blocking in high school; that much became pretty apparent as soon as the pads went on Saturday. Beal had a couple of drops on day one, looking exactly like a true freshman battling nerves in his first-ever college football practice. By day three, the 265-pounder from Louisiana was catching the ball and, as the intensity of practice was ratcheted up a few notches, was extremely physical and aggressive at the point of attack as a blocker. It's still insanely early, but Tim Brewster may well have three able-bodied blockers at his disposal in year one as the Aggie tight ends coach. • Let me start my o-line discussion by saying one thing: I'm convinced that this year's unit will be noticeably better than last year's group and, really, anything the Ags have put on the field since the 2013 season. If that's not a high enough bar for you (and I totally understand if it isn't) then let me put it this way: I see Jim Turner fielding a solid SEC o-line in 2018. In order to get there, the third-year position coach (in his second tour of duty in CS) is going to have to figure out either the center position or slide Erik McCoy back into the middle, and in my opinion, he's going to have to do one or the other in relatively short order. Turner has to be operating with perhaps even more of a sense of urgency than other coaches working out their playing rotations, due in part to the fact that Clemson and Alabama appear on the September schedule. Junior Colton Prater opened camp in the middle, and McCoy was back at the spot he's started at the past two seasons on Sunday and Monday. When Erik was at center, sophomore Jared Hocker was at guard and reportedly had a couple of nice practices. On Tuesday, the first-team OL featured sophomore Ryan McCollum at center and McCoy back at guard. Those are your three most likely options, so Turner is essentially waiting to see which player has the most impressive (or at least encouraging) fall camp between Prater, Hocker and McCollum. Too early to tell, but I do think Turner has to be operating with perhaps even more of a sense of urgency than other coaches working out their playing rotations, due in part to the fact that Clemson and Alabama appear on the September schedule and because lots of shuffling late in fall camp and into the season in '16 and '17 (probably out of necessity, mind you) led to shaky early o-line play that the Ags never really shook. Another, more down the road option would be true freshman Luke Matthews emerging as a candidate at center. For now, he's playing tackle and is off to a pretty encouraging start on the outside. I honestly would have thought Luke was a better fit on the inside, and that may ultimately be the case, but his frame, strength, length and footwork are plenty good (and then some) to play tackle at the college level. A second true freshman who has caught my eye is Tank Jenkins. He's certainly a candidate to redshirt, but the way the big man moves and as flexible he is for a man his size (which I have to think is around 6-4 and 320-330 pounds) is beyond impressive. It's NFL type stuff. He reminds me of the guys I've seen fly under the radar in the SEC and then emerge as All-Conference and NFL Draft picks. As far as veterans go, this is a pretty important camp for guys like tackles Kellen Diesch and Riley Anderson. They're currently battling for spots on the second-team offensive line. Considering the fact that the two projected starters at tackle are a year younger, Matthews and Colten Blanton are manning the bookends as true freshmen, and the way Turner and Co. are stockpiling talent up front, the time is now if either third-year blocker plans on making any sort of real move up the depth chart or to at least give their position coach an indication that they'll factor into the playing time mix at some point down the road. Pretty important camp for any veteran not in Turner's top seven, so I'd say we're now entering a stretch of practices (and especially scrimmages) where holding your spot with the 2s would seem an absolute must. Lanfear doesn't move around like he used to but is still out there toughing it out as a backup and doing everything he can to set an example and impart wisdom and experience on the young guys. He's a leader and a very valuable member of that room. Finally, injuries have really taken a toll on senior and one-time starter Connor Lanfear, but he deserves mention any time you talk about the progress of the young Aggie blockers. Here's a dude who doesn't move around like he used to but is still out there toughing it out as a backup and doing everything he can to set an example and impart wisdom and experience on the young guys. He's a leader and a very valuable member of that room. • Here's what I really like about the Aggie offensive line: McCoy and Keaton Sutherland are both quality SEC blockers, they boast a lot experience and are legitimate NFL talents. Sutherland is probably the Ags' most consistent guy up front. He and McCoy have spent most of camp lining up against the strength of the A&M team at defensive tackle and are holding their own. At tackle, Carson Green and Dan Moore are progressing nicely, and I'd be surprised if they didn't prove a solid set of bookends as sophomores. • I'm not sure there's a more difficult position on the team to try and pin down right now than wide receiver. There's good depth and good talent, but what is yet to be determined (and is probably far from it, actually) is who the starters are, which backups are a part of the regular rotation and if there is a star and/or breakout performer in the group. In other words, Dameyune Craig has a lot to sort through over the next 2-3 weeks. We know that sophomore Jhamon Ausbon is a trusted weapon at one of the outside spots. He's already proven that he's a quality SEC player at the position, but I think what Craig, Jimbo Fisher and Darrell Dickey would like to see more of between now and the fall is the Ags' most consistent weapon emerging as a little bit more of a big play threat, someone who can regularly hit opposing defenses with backbreaking grabs. Sophomore wide receiver Camron Buckley has made some impressive plays throughout camp and is competing for a starting spot. Beyond Jhamon, the battle for playing time (and starting spots) is still totally up for grabs. Sophomore Cam Buckley has made some sensational catches in camp, as has Kendrick Rogers. Kendrick is a guy who occasionally looks like the best offensive player on the field, making jaw-dropping grabs with ease. However, he's also been prone to drops throughout his short A&M career, a problem that he's yet to put completely in the rearview mirror. He's still THE guy that I get the feeling the Aggies believe is capable of changing the look of the position if he can put it all together. He's certainly progressing in that direction but not there yet. • To put it simply, the A&M passing game is still very much a work in progress, which is to be expected when a team is unsettled at quarterback and returns just one receiver with any experience of note. Too many balls hitting the grass for Fisher and Dickey's preference, I would have to imagine. 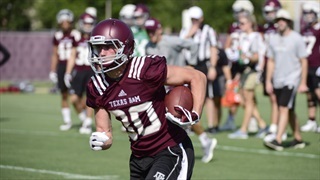 That said, the Aggie wideouts will be looking to have a big first full scrimmage and second week of work, and anyone who steps up and emerges as either reliable or a big-play specialist (or both) has a chance to make a major move up the depth chart. • True freshmen Caleb Chapman and Jalen Preston are like most of the other members of their class right now - flashing their potential but still generally relegated to opening practice with second- or third-team reps. I think it's important to note that we are still, in fact, less than one full week into practices and both players are already turning heads. I'm confident enough with what I've seen and heard already to say our off-season projections of both seeing the field from day one will be spot on. We knew Caleb was going to be a very tough mark deep down the sidelines and on contested balls, but what's impressed me most is how under control he is on the shorter stuff and during his routes. He's just a gifted athlete, plain and simple, and a hard worker who has really come in prepared to battle for a spot. He'll be a very polished receiver in short order. Preston's ability to play in the slot could ultimately lead to him being one of the first freshmen to break into starting lineup, but there is still work to be done. Outside of the sophomore trio I mentioned and the true freshmen, it seems like a different player steps up and makes some noise every practice. One day it's Roshauud Paul, the next it's Clyde Criss or Hez Jones. One name that I've heard more than I expected thus far is Quartney Davis. The once-heralded recruit tore his ACL the summer before his true freshman season and is finally back to where he was when he chose A&M over USC, Auburn and Texas coming out of Langham Creek. We're only a few practices in, but I'd say Davis would qualify as one of camp's pleasant surprises thus far. If anyone is in the midst of making a strong push for a starting job at this time, it's Quartney. Could he be this year's Landis Durham? A veteran who comes from way back to claim a starting job and make a significant contribution? Quite possibly so. If the season started today, I suppose we'd see Ausbon and Buckley take the field with the 1s with Rogers or Davis claiming the third spot, but we're a long way from that and there are several others knocking on the door.